1 January 2014 -BBC football expert Mark Lawrenson examines where each Premier League side needs to strengthen, if they are looking to offload, or if they are just trying to retain their best players. "So many teams are short of goals - I have never known a season like it," Lawrenson told BBC Sport. "There are 11 teams that need a new striker: Arsenal, Cardiff, Chelsea, Crystal Palace, Everton, Fulham, Hull, Stoke, Sunderland, Tottenham and West Ham. "A lot of these teams will be going for the same players. The dilemma is, do they go for somebody who has played in the Premier League or do they go for the ultimate gamble in January and go for somebody unproven here?" What they need in a nutshell: One of those teams who needs a new striker. 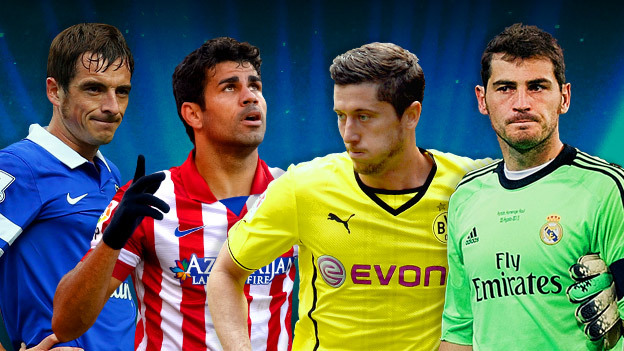 Window shopping: Should they throw big money at getting a goalscorer in January? Well, if you think about it, they are going to have to buy a striker in the summer anyway, whether they win the title or not. So, why not try to go for it in January and try to get whoever they are looking at in then? They undoubtedly have the money and the worst case scenario is that if the new man does not settle in straight away then he will be ready by next August rather than trying to settle in then. Gunners boss Arsene Wenger is a little bit reluctant sometimes to pay over the odds, and he might have to pay more to get his man now. But Wenger has nicked enough players for peanuts to splash out in January. If he overpays for a player who wins Arsenal the league then it has got to be worth it. Linked with (Player, age, position and club): Iker Casillas 32, GK (Real Madrid), Fabian Schar 22, RB (Basel), Kurt Zouma 19, CB (St Etienne), Youssouf Mulumbu 26, DM (West Brom), Ilkay Gundogan 23, CM (Borussia Dortmund), Angel Di Maria 25, FW (Real Madrid), Diego Costa 25, CF (Atletico Madrid), Karim Benzema 26, CF (Real Madrid), Alexandre Pato 24, CF (Corinthians), Dimitar Berbatov 32, CF (Fulham), Pedro 26, FW (Barcelona), Alvaro Morata 21, CF (Real Madrid). What they need in a nutshell: Not much to spend, even if they wanted to. Window shopping: Aston Villa boss Paul Lambert did not panic last January when Aston Villa were on a poor run and I cannot see him panicking now. He needs a fit and rejuvenated Christian Benteke in the team, scoring goals again. Benteke has been out of form this season but there is no point Lambert buying a new striker when he has such a good one already in his squad, unless he thinks he can trade him. Would Villa sell Christian Benteke in January? He might surprise us all because he might think that he could get £20m for Benteke and then bring somebody else in - he could get two or three players with that sort of money. Otherwise, there will not be massive funds available for him to spend. Linked with: Jamaal Lascelles 20, CB (Nottingham Forest), Mousa Dembele 26, CM (Tottenham), Simeon Slavchev 20, CM (Litex Lovech), Wilfried Zaha 21, FW (Manchester United), Ashley Young 28, FW (Manchester United), Paul-Georges Ntep 21, CF (Auxerre). What they need in a nutshell: Somebody to lead their attack. Window shopping: Whoever replaces Malky Mackay as manager has been promised substantial funds to strengthen his squad. They need to spend some of that on a striker. The rest of the team is competitive in the Premier League but they need more of a presence up front. Andreas Cornelius was supposed to supply that after signing for a club-record £7.5m in the summer. Cornelius has had injuries but he has not really had a chance to prove himself yet and he might still need time to settle in. The Bluebirds need somebody to lead their attack now. Linked with: Wilfried Zaha 21, FW (Manchester United), Nabil Bahoui 22, FW (AIK Stockholm), Thomas Ince 21, FW (Blackpool), Hugo Vieira 25, CF (Braga). What they need in a nutshell: A striker who scores goals. Window shopping: It is clear that Chelsea need a striker and, although Jose Mourinho claims he is not going to sign one in January, I refuse to believe he won't try. If, as with Arsenal, the Blues are going to sign somebody in the summer anyway then it makes no sense to wait. Linked with: Luke Shaw 18, LB (Southampton), Andrea Ranocchia 25, CB (Inter Milan), Kurt Zouma 19, CB (St Etienne), Eliaquim Mangala 22, CB (FC Porto), Nemanja Matic 25, DM (Benfica), Fredy Guarin 27, CM (Inter Milan), Ivan Rakitic 25, CM (Sevilla), Kevin Volland 21, FW (Hoffenheim), Radamel Falcao 27, CF (Monaco), Jackson Martinez 27, CF (FC Porto ) , Mario Balotelli 23, CF (AC Milan) Diego Costa 25, CF (Atletico Madrid), Xabi Alonso 32, CM (Real Madrid). What they need in a nutshell: More quality, and more experience. Window shopping: The squad that Crystal Palace boss Tony Pulis inherited are playing for him and are giving everything they have got. But Pulis needs a bit more quality in every position. That might sound a little bit nuts but that is the predicament they are in. They came up late through the play-offs so Ian Holloway, who was in charge over the summer, had less time to plan for the Premier League and their squad definitely reflects that. I would expect Pulis to be busy, with a few players leaving and a few arriving. He will probably be looking for experience, especially up front. Linked with: Joe Ledley 26, CM (Celtic), Nabil Bahoui 22, FW (AIK Stockholm), Sone Aluko 24, FW (Hull), Wilfried Zaha 21, FW (Manchester United), Simon Makienok 23, CF (Brondby), Filip Djordjevic 26, CF (Nantes), Jordan Rhodes 23, CF (Blackburn), Bafetimbi Gomis 28, CF (Lyon). What they need in a nutshell: A forward to offer back-up to Romelu Lukaku. Window shopping: Everton clearly do not need any drastic surgery to their squad but they could do with another striker. Arouna Kone is out injured for the foreseeable future and it looks like Nikica Jelavic could be on his way out. Linked with: John Souttar 17, CB (Dundee United), Bruno Martins Indi 21, CB (Feyenoord), Yann M'Vila 23, DM (Rubin Kazan), Eddy Onaz 21, CM (Lazio), Ryan Gauld 18, AM (Dundee United), Aiden McGeady 27, AM (Spartak Moscow), Nabil Bahoui 22, FW (AIK Stockholm), Wilfried Zaha 21, FW (Manchester United), Diogo Viana 23, FW (Gil Vicente), Alfred Finnbogason 24, CF (Heerenveen), Michy Batshuayi 20, CF (Standard Liege). Alex McCarthy 24, GK (Reading). What they need in a nutshell: A foil for Dimitar Berbatov and a new centre-back. Window shopping: Rene Meulensteen has had a bit of time to assess his squad and he will be looking to ship players out as well as bring new ones in. Will Fulham striker Dimitar Berbatov stay at Craven Cottage in January? If Berbatov does stay, then he needs a new partner up front because it has not worked out with Bryan Ruiz, and Darren Bent has not done the business this season, which is very strange. They need a top-class striker to play in front of Berbatov, and they will be looking for someone who can pinch some goals, and hold up the ball too. Basically to play up there on his own if needs be. Bent does play up front on his own, but the problem with him is that he does not give you anything in general play. The Cottagers' other problem area for me is centre-back because they do not look strong in that position. They leak a lot of goals and they have got a soft centre. Linked with: Phil Bardsley 28, RB (Sunderland) Benjamin Angoua 27, CB (Valenciennes), Tomas Rincon 25, DM (Hamburg), Anderson 25, CM (Manchester United), Wilfried Zaha 21, FW (Manchester United), Balazs Dzsudzsak 27, FW (Dynamo Moscow), Ishak Belfodil 21, CF (Inter Milan). What they need in a nutshell: Another team who will be chasing a striker. Window shopping: Hull just need a goalscorer. They scored six against Fulham over Christmas but their top scorer in the Premier League is midfielder Robbie Brady with three goals and, if somebody could put away all the chances their good play creates, they would be even higher up the table. Linked with: Sebastian Larsson 28, CM (Sunderland), Shola Ameobi 32, CF (Newcastle), Filip Djordjevic 26, CF (Nantes), Shane Long 26, CF (West Brom), Steven Fletcher 26 , CF (Sunderland), Nick Powell 19, AM (Manchester United), Georgios Samaras 28, CF (Celtic). What they need in a nutshell: A young striker to learn off Luis Suarez. Window shopping: I don't think Brendan Rodgers needs to do much in January because he has lots of options in attack, midfield and defence and they have proved they can cope without Steven Gerrard or Daniel Sturridge when they have been injured. If Suarez is sidelined then that is a different matter of course but any team in the world would miss him in the form he is in. I just wonder if Rodgers might go for a young striker or attacking midfield player because if you got the right player in now then he could learn off players like Suarez, Gerrard and Philippe Coutinho and you could bring him along very quickly. The Liverpool squad is certainly not crying out for reinforcements but, with Suarez having just signed a new deal and Liverpool in the title race despite their defeats over Christmas, this might be a good time for Rodgers to go and ask for the funds for another big signing. Linked with: Martin Montoya RB, 22 (Barcelona), Ryan Bertrand 24, LB (Chelsea), Ivan Rakitic 25, CM (Sevilla), Arda Turan 26, AM (Atletico Madrid), Javier Pastore 24, AM (Paris St-Germain), Everton Ribeiro 24, AM (Cruzeiro), Koke 21, AM (Atletico Madrid), Ryan Gauld 18, AM (Dundee United), Mohamed Salah 21, FW (Basel), Danny Ings 21, CF (Burnley), Emmanuel Agyemang-Badu 23, CM (Udinese) Pedro 26, FW (Barcelona). What they need in a nutshell: A defensive partner for Vincent Kompany. Window shopping: Their squad looks very strong in every area apart from centre-back where they have problems whenever Kompany is injured. Martin Dimichelis has not convinced me and it is clear the manager Manuel Pellegrini does not fancy Joleon Lescott much either. What they need in a nutshell: The top-class midfielder they wanted last summer. Window shopping: Manchester United needed to sign a creative midfielder to replace Paul Scholes when he retired first time round in 2011, and they still have not done it. Everybody knows that, so United are getting linked with a lot of players and obviously not every rumour is true. I see Wesley Sneijder is being talked about again, the same as he is every transfer window, but there is probably more chance of United signing Wesley Snipes. Is Galatasaray midfielder Wesley Sneijder on United's radar again? Whether they do get the man they want now or at the the end of the season might be subject to availability - it might be more difficult to make that kind of signing in January because top clubs do not want to sell their best players in the middle of the season. But I would expect United to try very hard to push a deal through because, unless they do get someone of real quality in that area, you cannot say with any confidence that they are going to finish in the top four. Getting some more creativity in the team is even more of a priority when you consider Robin van Persie might be having one of those spells that affected him at Arsenal, when he missed a lot of games through injury. Ideally they need to get four or five in and let four or five go but it is the wrong window to be doing that kind of thing. Linked with: Alex Sandro (22), LB (FC Porto), Nemanja Matic 25, DM (Benfica), Fredy Guarin 27, CM (Inter Milan), Ilkay Gundogan 23, CM (Borussia Dortmund), Wesley Sneijder 29, CM (Galatasaray), Koke 21, AM (Atletico Madrid), Marco Reus 24, AM (Borussia Dortmund), Ryan Gauld 18, AM (Dundee United), Arda Turan 26, AM (Atletico Madrid), Leighton Baines 29, LB (Everton), Luke Shaw 18, LB (Southampton), Adam Lallana 25, AM (Southampton), Angel Di Maria 25, FW (Real Madrid) Ross Barkley 20, AM (Everton), Antoine Griezmann 22, FW (Real Sociedad), Pedro 26, FW (Barcelona). What they need in a nutshell: Quality, not quantity. Window shopping: Newcastle did some very good business in the last January transfer window. It took some of those players a while to settle in and get used to the Premier League but they are reaping the benefits this season. The Magpies first XI is very strong indeed and, bearing in mind they only made one notable signing in the summer - QPR striker Loic Remy who has come on loan and done very well - I think United manager Alan Pardew is in a good position if somebody he really wants becomes available. I don't see Pardew making many signings this time around and, if he does, it will be a case of quality, not quantity. If they don't get anyone then I don't see it being a massive problem. As far as people leaving, it is no surprise to see Yohan Cabaye's name back in the papers. But Arsenal - who bid for him in the summer - say they don't want him now and Pardew seems to be adamant that Cabaye is staying. The good thing from his point of view is that he does not have to buy players and he does not need to sell anyone either. Linked with: Alex McCarthy 24, GK (Reading), Warner Hahn 21, GK (Dordrecht), Chris Samba 29, CB (Dynamo Moscow), Mousa Dembele 26, CM (Tottenham), Wilfried Zaha 21, FW (Manchester United), Ola Toivonen 27, FW (PSV Eindhoven), Luuk de Jong 23, CF (Borussia Monchengladbach), Bafetimbi Gomis 28, CF (Lyon), Cheick Diabate 25, CF (Bordeaux), Alfred Finnbogason 24, CF (Heerenveen). What they need in a nutshell: A defensive rock. Window shopping: Norwich's centre-backs have looked very inconsistent to me. If City manager Chris Hughton were to make one signing, it would be somebody who could make the Canaries more solid at the back because, at the moment, they don't look convincing defensively. Linked with: Ola Toivonen 27, FW (PSV Eindhoven), Olly Mehew 16, CF (Bristol Rovers). What they need in a nutshell: To keep their best players at St Mary's. Window shopping: There has been a lot of speculation about which teams are watching Southampton's players and I think manager Mauricio Pochettino's priority will be to hold on to the likes of Luke Shaw and Adam Lallana. Linked with: Davide Astori 26, CB (Cagliari), Cheikhou Kouyate 24, CB (Anderlecht), McDonald Mariga 26, DM (Inter Milan), Ever Banega 25, CM (Valencia), Diego 28, AM (Wolfsburg). What they need in a nutshell: To increase their attacking options. Window shopping: This Stoke side already feels more like Mark Hughes's team despite the fact he has not had much money to spend since taking charge in the summer. For me they are another team that needs a striker, or at least a clever player in an advanced position. They are still a little bit predictable going forward at the moment. Linked with: Joe Hart 26, GK (Manchester City), Joleon Lescott 31, CB (Manchester City), Jed Wallace 19, CM (Portsmouth), Nick Powell 19, AM (Manchester United), Wilfried Zaha 21, FW (Manchester United), Luuk de Jong 23, CF (Borussia Monchengladbach), Ivica Olic 34, CF (Wolfsburg), Mame Biram Diouf (26), CF (Hannover), Michael Mancienne 25, CB (Hamburg). What they need in a nutshell: Numbers. But they need sell before they can buy. Window shopping: Sunderland manager Gus Poyet has to sell before he can buy but he needs to generate some funds to get some more goals in his team - making chances, and taking them. They do not score enough goals, which means they are always hanging on in games. The problem with having to sell before you can buy is that you can only sell your better players. So this is a nightmare situation for Poyet. Linked with: Wayne Bridge 33, LB (Reading), Marcos Alonso 23, LB (Fiorentina), John Souttar 17, CB (Dundee United), Liam Bridcutt 24, DM (Brighton), Tomas Rincon 25, DM (Hamburg), Nabil Bahoui 22, FW (AIK Stockholm), Valmir Berisha 17, CF (Halmstads). What they need in a nutshell: An experienced keeper as back up for Michel Vorm. Window shopping: Swansea manager Michael Laudrup knows his whole squad pretty well by now after having to juggle his players because of their busy schedule in the Europa League. The position I think they need to strengthen most is in goal. They need an experienced Premier League player to cover for the injured Michel Vorm and somebody like Aston Villa keeper Shay Given, who would probably be available, would be ideal to steady the ship. Linked with: Abdisalam Ibrahim 22, CM (Manchester City), Wilfried Zaha 21, FW (Manchester United), Thomas Ince 21, FW (Blackpool). What they need in a nutshell: A left-back, so they can strengthen in the centre. Window shopping: After signing so many people over the summer, the last thing Spurs need now is a lot more new players to bed in but what they do need is a new left-back so Jan Vertonghen can return to the centre of defence. Benoit Assou-Ekotto is on loan at QPR but I would leave him there and try to get somebody else in. There is a young kid at Ipswich called Aaron Cresswell who has been playing very well but he has just signed a new deal. Then there is someone like Southampton's Luke Shaw who has also been linked with a move, but I cannot see that one happening. Even if Spurs got an experienced left-back as a short-term signing it would benefit the team because Spurs' full-backs are well protected on the flanks with two wingers in front of them. Down the middle, they need Vertonghen. Linked with: Andrea Ranocchia 25, CB (Inter Milan), Fredy Guarin 27, CM (Inter Milan), Diego Perotti 25, AM (Sevilla), Mohamed Salah 21, FW (Basel), Ciprian Marica 28, FW (Getafe), Ezequiel Lavezzi 28, FW (Paris St-Germain), Kevin Volland 21, FW (Hoffenheim), Alexandre Pato 24, CF (Corinthians), Paul-Georges Ntep 21, CF (Auxerre), Giuseppe Rossi 26, CF (Fiorentina), Alex Buttner 24, LB (Manchester United), Luke Shaw 18, LB (Southampton), Shane Long 26, CF (West Brom). What they need in a nutshell: A new manager but he will not get many new players. Window shopping: West Brom need a new manager first but, from the sounds of things, whoever does get the job will not be able to make drastic changes to the squad, which is already bigger than chairman Jeremy Peace would like. I don't think they really need to make any big changes, though, because in the last few games, where caretaker manager Keith Downing has been in charge, we have seen what we knew from last season - they are a good side, and they were just on a bad run when Steve Clarke got sacked. The new manager will be inheriting a good squad. Linked with: Aaron Cresswell 24, LB (Ipswich), Wilfried Zaha 21, FW (Manchester United). What they need in a nutshell: A big striker for Big Sam. Window shopping: It is not a case of if West Ham get a striker in the transfer window, it is when. I think they will do it on 1 January or at least as quickly as they can. The owners know what is needed and they will back their manager Sam Allardyce. What will Allardyce go for striker-wise? Someone who is really big and can head the ball! I think he would like somebody with Premier League experience if possible, but he might have to gamble because he needs to get somebody in. Linked with: Chris Samba 29, CB (Dynamo Moscow), Wilfried Zaha 21, FW (Manchester United), Obafemi Martins 29, CF (Seattle Sounders), Diego Milito 34, CF (Inter Milan), Demba Ba 28, CF (Chelsea), Andre-Pierre Gignac 28, CF (Marseille), Nikica Jelavic 28, CF (Everton), Jermain Defoe 31, CF (Tottenham), Diego Forlan 34, CF (Internacional), Alfred Finnbogason 24, CF (Heerenveen), Asamoah Gyan 28, CF (Al Ain), John Heitinga 30, CB (Everton), Leo Baptistao 21, CF (Atletico Madrid). * Ages correct as of 1 January 2014.